Home / Retrospective / The Films: 1980 / Sean Cunningham Originally To Play Officer Dorf In 1980 Film! Sean Cunningham Originally To Play Officer Dorf In 1980 Film! What if Michael J. Fox wasn't able to be cast in Back To The Future? Would the movie have been so popular and successful? What if the shark actually worked for the entire filming schedule on Jaws? Would the movie be as tense and suspenseful? We will never know about those scenarios, but when it comes to Friday the 13th, there are a lot of those "what if" situations. 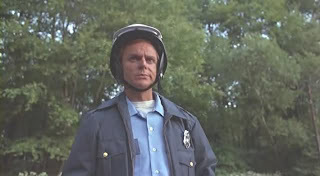 Take for instance the Officer Dorf character in Friday The 13th 1980. Would you believe that Director Sean Cunningham was ready to strap up the boots and wear the helmet? In an interview with Christian Sellers a few years ago, the actor who played Dorf in the film, Ron Millkie, was asked how he prepared for the role and how long he was on set during filming. Below are his answers and responses and the mention of Sean Cunningham and the Officer Dorf character. "Is it totally cast, Sean?" Sean: "Yeah, Ron, were already shooting....... wait a minute.... yeah, there might be a part for you... I was going to play the part myself (yes, Sean would have played Officer Dorf if I hadn't made the call that day). Why don't you come up to Blairstown (N.J.) tomorrow and I'll have you read." The next day I had about fifteen minutes to read over the part and read with Harry Crosby, Kevin Bacon and Laurie Bartrum (God rest her soul), Sean was smiling and said...."You got the part." I only had a couple of days to learn the lines and the role sort of kicked in when I was learning the lines. I was on the set for two days and was present in the cabin when Kevin Bacon go the knife through the throat. It was done with such precision and professionalism, I knew it was going to be a class production." There are many instances of Directors, writers, or producers of films making cameos in their own films and this would have been another great trivia item for Friday The 13th fans if Sean did indeed play the part. What do you think? Would you have liked to see him play Officer Dorf, or is Ron Millkie's portrayal of the character too memorable to ever want to change?